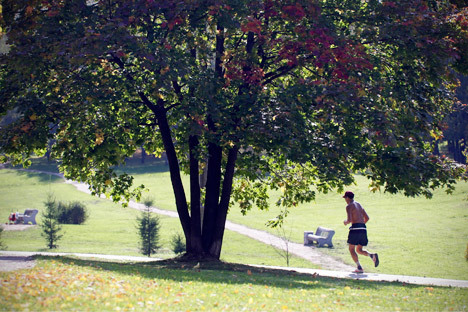 Running is becoming increasingly popular in the Russian capital thanks to the efforts of local race organizers and the city government, which has cleaned up major parks. Over the last few years, the popularity of running in Moscow has been on the rise, although the city has still a long way to go before it becomes comfortable for runners. The first running clubs in the Russian capital, such as Fakel, date back to the 1970s. However, their membership was limited, and runners in Moscow’s streets or parks looked very out of place. The demise of communism in the early 1990s and the ensuing economic chaos did little to boost the popularity of running. But in the 2000s, as city parks began to get facelifts and young Russians took up the idea of living a healthy lifestyle along with other global fashions and trends, the situation began to change. And although the number of runners in Moscow’s Gorky Park is still noticeable smaller than, say, in New York’s Central Park, it is still large enough to talk about running as a steadily growing trend. “People’s interest in running has been on the rise,” said Alexandra Boyarskaya, head of the running club Nike Plus at Gorky Park. She suggested that one of the reasons was that ideas about running that were first spread in the United States back in the 1970s have finally made it to Russia, along with other ideas about sports and health. For many, running is part of the sports and healthy-lifestyle activities that have recently gained in popularity, such as yoga and bicycle riding. But some people just try it as something new and like it enough to continue. According to Boyarskaya, the demographics of the several thousand people who showed up for her club’s training sessions last summer runs the gamut, although most of them are young people between 17 and 27. Expats also show up, she added. Another factor that has helped to raise interest in running was activities by large companies, especially manufactures of sports clothes and equipment, that promote running as a lifestyle rather than just purely a sport. Nike has sponsored a series of races in Moscow since 2011. Responding to the overall surge of interest in running, new clubs have begun to pop up around the city in addition to those that have survived since the Soviet era. Currently, more than a dozen running clubs are operating in Moscow. But many people show up for running classes to get a basic knowledge of techniques, stretches and other preparatory exercises and then go on run on their own rather than run regularly with a club. This summer, the city’s race calendar has been full with races nearly every weekend. The organizers of the Moscow Marathon sponsored a series of 5k and 10k races, including a Night Run on the longest day of the year and a Color Run in August. Another group organized two half-marathons – one in mid-May and one in early August. The capital’s most important running event this year is the Moscow Marathon, which will be held Sept. 15. However, runners in Moscow still face many challenges. While Gorky Park is almost as comfortable for runners as parks in major Western cities, other parks may not appear that safe and convenient. Moscow has serious problems with street dogs in addition to insufficient lighting at night and poor quality of running paths. Boyarskaya agreed, saying “The city isn’t convenient for running just as it isn’t convenient for living,” adding that some people, especially women, don’t feel safe running in parks, while people who run on the streets have to face rude drivers and ice on the sidewalks much of the year. On the bright side, however, the huge size of Moscow creates an extra advantage for runners preferring the streets. “Some runners complain that running is boring. But in Moscow, you can always find a new route,” Boyarskaya concluded.